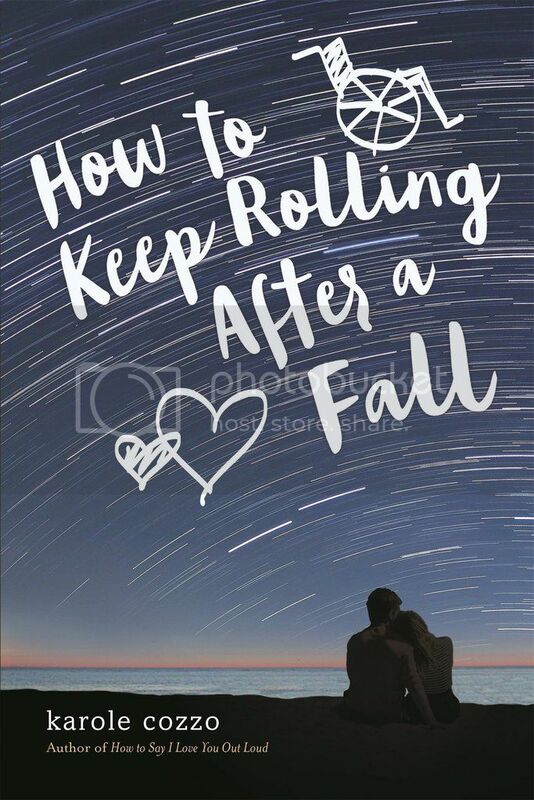 How to Keep Rolling After a Fall is the second book I've read by the super talented Karole Cozzo. I read her previous book, How to Say I Love You Out Loud last year when it first came out, and really enjoyed the story, so I was super excited to read something new by her. How to Keep Rolling After a Fall definitely did not disappoint!! Nikki was a mean girl through and through, and one night things went too far, which resulted in the complete humiliation of one of her classmates. Now she's been abandoned by her friends, expelled from her school, and even her own parents don't look at her the same way anymore. But then she meets Pax, a rugby player in a wheelchair, who shows her that second chances really can happen. I really didn't think I was going to like Nikki when we first met in the book. Her past definitely made her one of those people I always tried to avoid in high school. But as the story went along, I realized that she was a person that had remorse for what she did, I felt she truly regretted her actions. She definitely grew on me as the story went along, and it was interesting to read the story through the eyes of the bully, and not the victim. There were some really great secondary characters in the story as well, including Pax, who I loved from the beginning. *Wink*I have to admit, I absolutely adore the relationship between Nikki and Pax, not only because there were lots of swoon-worthy moments between them, but because I felt like they totally understood each other in a way a lot of people don't. Even after finding out what Nikki had done, he gave her a chance to prove who she really was, and he liked her despite her past. And, as I mentioned before, the romance between the two was super sweet, and I really loved it. I love that the storyline for the book has a great message about cyber bullying and the consequences of the actions you make in life. I love so much that there are books like this in the world, for people who may be going through something similar, as either the one being bullied to show that there is hope, and to a would-be bully, to show that there are definitely consequences to any action you make. Overall; How to Keep Rolling After a Fall is definitely one of the best books I've read so far this year. I loved everything from the characters, to the story, and definitely the message it sent out. Karole Cozzo is definitely an author I'm keeping my eye out for in the future. I'm really looking forward to reading more by her soon! !